I have a now-discontinued Harken furler unit for my F-27GS trailerable trimaran. This furler is made of an extruded PVC foil with a braided stainless internal liner, with a rod that passes through as the actual forestay. I really like this flexible foil because of its ease of use when raising the mast as well as the fact that it can be somewhat coiled and stowed in the boat for travel. After probably 10-12 years of use, the PVC extrusion failed at the boltrope feeder. The split broke the PVC in two at the feeder, not vertically up the foil, but circumferentially. The liner, and of course the rod rigging, stayed intact. Harken, having discontinued this furler unit, had no solutions to offer. 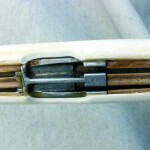 About the same time this failure occurred, WEST SYSTEM® came out with their G/flex® epoxy formula. The descriptions suggested that plastic repairs could be effected with G/flex and so I decided to repair my flexible foil. 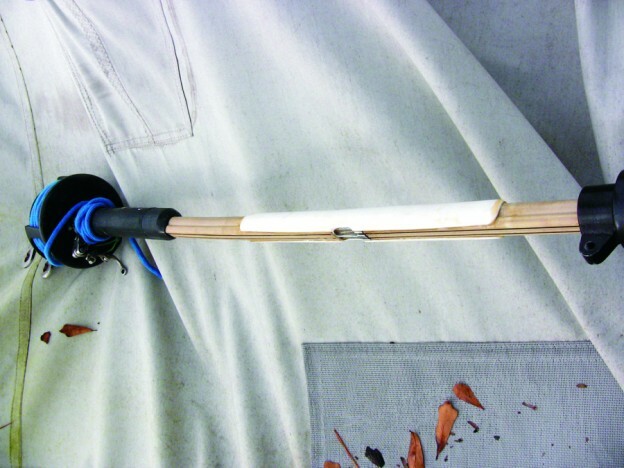 Given that the foil is PVC, I thought that it might work to bridge the split with a piece of Schedule 40 PVC water pipe, gluing it in with the G/flex. I first selected a diameter of PVC which was close to that of the foil. I cut a piece of the PVC much longer than I thought necessary to bridge the split, but I was concerned about loads from the furling drum causing another crack beyond the area of repair. With the extra long PVC bridge I hope to reduce bending of the foil around the feeder area. With a hacksaw, I cut the PVC piece longitudinally. I began to slip the opened PVC piece over the foil at the masthead (top) end. This was merely for ease of shaping the PVC, one could mold the PVC anywhere along the foil, I suppose. Then while pushing the PVC down the foil, I heated the PVC with a heat gun to shape it to the foil’s shape. Bear in mind it doesn’t take a very high temperature to achieve flexibility in the PVC. I kept a rag in my hand so I could squeeze the PVC to shape on the foil. In doing so, the cut opened up enough to expose the boltrope tracks. With the PVC piece shaped and cooled I removed it from the masthead and moved it to the repair area. 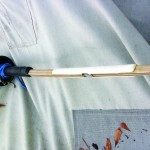 I prepped the foil extrusion and the inside of the PVC sleeve with the alcohol wipe and flame treatment (see page 18). After this, I masked the boltrope track and pre-feeder with clear packaging tape to prevent epoxy from getting into the track. I used the pre-thickened G/flex 655 Adhesive for this repair. I mixed up enough to fill the channel in the PVC quite generously and then slipped the PVC over the foil extrusion, centering on the broken area. I allowed excess to ooze out of the gap between the foil and the PVC. I then cleaned up the excess, wrapped the whole repair with wax paper and clamped it into place with a series of spring clamps, one every 2″ or so, and allowed it to kick off. After cure, I spent a fair bit of time cleaning epoxy out of the pre-feeder. I’d had difficulty masking it. In retrospect, it would have been well worth the effort to do a more thorough job of masking things off before gluing. Once I sanded and faired the PVC to the foil extrusion, the repair was complete. The next weekend I took it sailing. The repaired furler with the PVC sleeve. Close-up of the boltrope feeder. 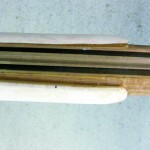 Close-up of the rounded PVC sleeve end.